JAMES MCMURTRY is the lone son of acclaimed author Larry McMurtry (Lonesome Dove, Terms of Endearment), and he grew up on a steady diet of Johnny Cash and Roy Acuff. McMurtry is a Texas rock/country singer, songwriter, guitarist, band leader, and actor. 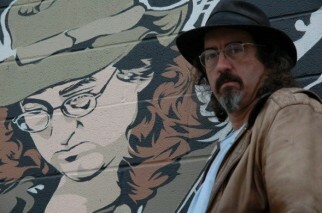 In 1989, McMurtry released his debut album, Too Long in the Wasteland. The album was produced by John Mellencamp. In 1996, McMurtry received a Grammy nomination for his Longform Music Video of “Where’d You Hide the Body”. In 2004, he released “Live in Aught-Three” on Compadre Records. 2005′s Childish Things garnered some of the highest critical praise of McMurtry’s career and spent six weeks at No. 1 on the Americana Music Radio Chart in 2005 and 2006. In September 2006, Childish Things and “We Can’t Make It Here” won the Americana Music Awards for Album and Song of the Year, respectively. McMurtry received more Americana Music Award nominations for 2008′s Just Us Kids. This album marked his highest Billboard 200 chart position in more than 19 years. In 2009, Live in Europe was released, capturing The McMurtry Band’s first European tour and extraordinary live set. Along with seasoned band members Ronnie Johnson, Daren Hess, and Tim Holt, the disc features special guests Ian McLagan and Jon Dee Graham. Also, for the first time ever, video of the James McMurtry Band’s live performance is available on the included DVD. Never one to rest on his laurels, James McMurtry continues to tour constantly, and consistently puts on a “must-see” powerhouse performance.